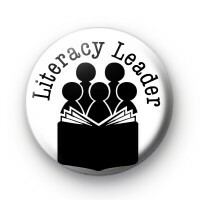 Literacy Leader badge in white with black text with school children huddled around reading a book. This badge is popular with schools & teachers. The badges are standard 25mm button badges & are handmade in our UK workshop.